Nikki Nicodemus, supervisor of the Juvenile Probation Work Detail program. Some of the youth she works with did the landscaping outside this building and several other county buildings. BATAVIA, Ohio (Sept. 29, 2016) – Several days a week, Nikki Nicodemus climbs into her Juvenile Probation van and makes sure that the youth offenders who have been assigned to Community Service get to their workplace and do their job. She’s been doing this for 11 years. She loves it. Summers and spring break are particularly busy, when most of the youth’s work is done outside in the heat. “I get to know these kids,” she said. “You hear their stories. Some of these kids aren’t learning any basic job skills at home.” She’ll often walk them through basic chores and yard work, demonstrating how to do the tasks. 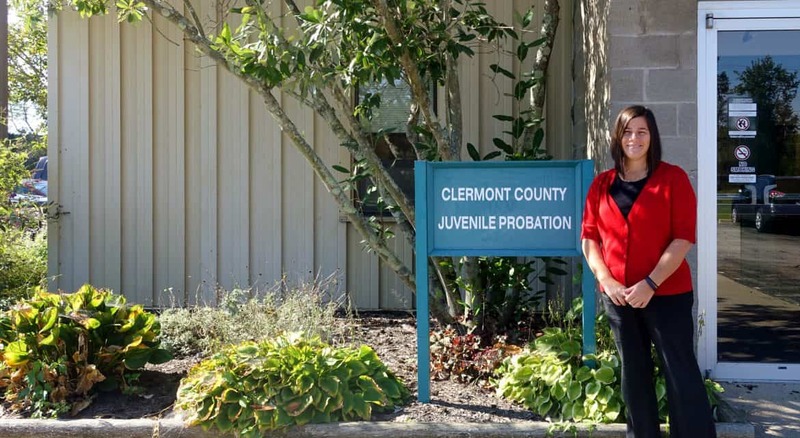 The Clermont County Juvenile Probation Work Detail Program, which Nicodemus supervises, was developed as an alternative sanction to youth offenders, allowing them a way of “paying back” the community. Typical offenses include traffic infractions like speeding, misdemeanor burglary, trespassing, and “unruly” charges, such as running away or violating curfew. Sometimes youth who are convicted of felonies may also perform community service. In 2015 there were a total of 1,517 delinquency filings in Juvenile Court (185 felonies and 1,332 misdemeanors) and 320 youth were supervised through the Probation Department. Of those, 227 youth participated in Community Service programs. These young people, ages 13-18, worked a total of 4,488 hours. Juvenile Probation has arrangements with employers throughout the county, many of them in the public sector, such as the Ohio Department of Transportation, Miami Township, Felicity School District, Clermont Northeastern School District, the Williamsburg Street Department, and Adams/ Brown County Recycling. Others include non-profits such as the Amelia Animal Rescue Fund, Milford/Beechmont St. Vincent De Paul, Amelia Grace & Mercy, Amelia All Dogs Come From Heaven, Loveland Grailville, Goshen Mellonridge Care Center, and New Richmond and Williamsburg Animal Clinic. One longtime partner has been the Ohio Department of Transportation and its “Adopt a Highway” program, Nicodemus said. Much of the work is done during spring break and summer vacation. The teens pick up litter along State Routes 133, 727, 276, 222, and 232. They also help clean up county and township roads. In 2015, the youth cleaned up 85 miles of roads, filling almost 600 bags of litter. “They are amazed by how much litter they find,” Nicodemus said. Nicodemus, who graduated in 2005 from the University of Cincinnati with a Bachelor’s in Criminal Justice, says she loves being out in the field with the teens. “These youths come in with so much hype and energy. At the end of the day, they are exhausted.” She said performing Community Service gives the youth a sense of accomplishment, and a sense that they are contributing to their community.